Sorry, there are no color photos of this car. It was dark (British Racing) green with white wheels. This Jaguar was my very first car! It was one of 2,484 left hand drive Fixed Head* Coupes built. It had been driven pretty hard, heck abused is more like it, before I bought it, but it looked great to me. It ran, handled and stopped well enough, and I had saved enough money to buy it. Nearly every mechanical part of the car broke except the Moss transmission. The Moss gearbox, or transmission as we Americans call them, was not state-of-the-art, even for the late 50s - fast shifts always resulted in a loud "grunch", and first gear wasn't synchromesh. I learned how to double clutch into first gear while moving which gave me a great feeling of accomplishment. I had a lot of fun with this car and I learned a lot. It set the tone for all my sports cars that followed. In the beginning of my quest for a sports car, my budget was such that I was thinking about buying an MG TD, a car that looked like it belonged in the 1930s. David quickly talked me out of an MG by saying that I would tire of the lack of power; only 57 bhp and a top speed of less than 80 mph! 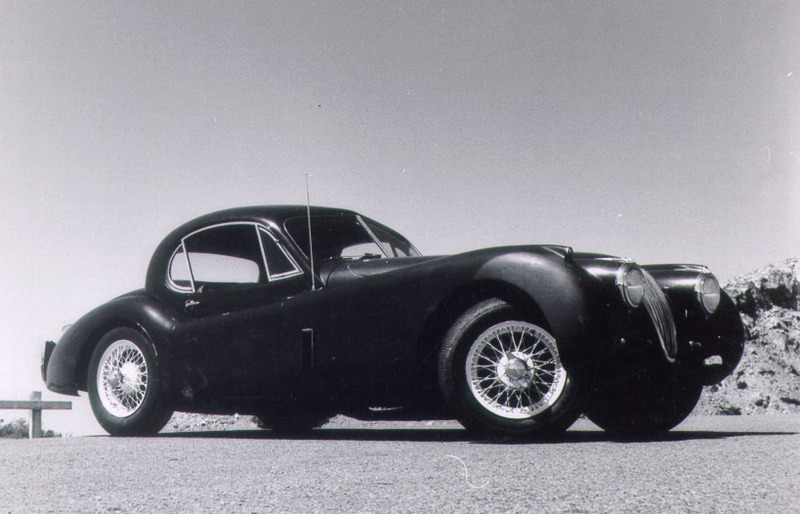 A Jaguar by comparison had 160-180 bhp, depending on the model, and was supposed to be good for 120 mph, hence it's name, XK120. 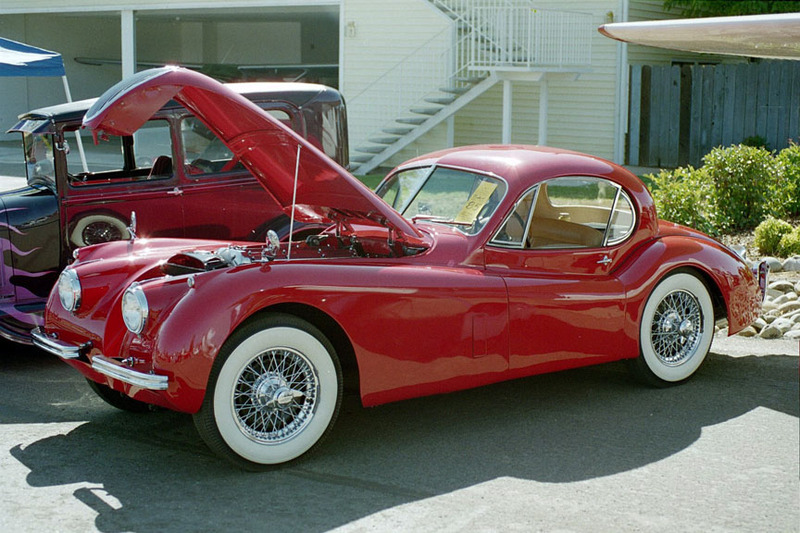 I quickly switched my allegiance to Jaguar, especially since Dave not only recommended I get one, but also because he was racing one and I spend a lot of time in his garage familiarizing myself with their mechanicals, in fact everything I could about them. * The English use different terms for their cars than we do. The roof, or top of the passenger compartment is called the head - fixed head is a hardtop, and a drop head is a convertible. Our hood is their bonnet, fenders are wings, and the trunk is called the boot. They also refer to "nearside" and "farside" which is stamped on the left side and right side knock-off wheel nuts. The car was brand new to me when these three photos directly below were taken. My mom worked at a camera store and was able to take loaner cameras home on weekends. These were taken with an amazing new Polaroid bellows camera. 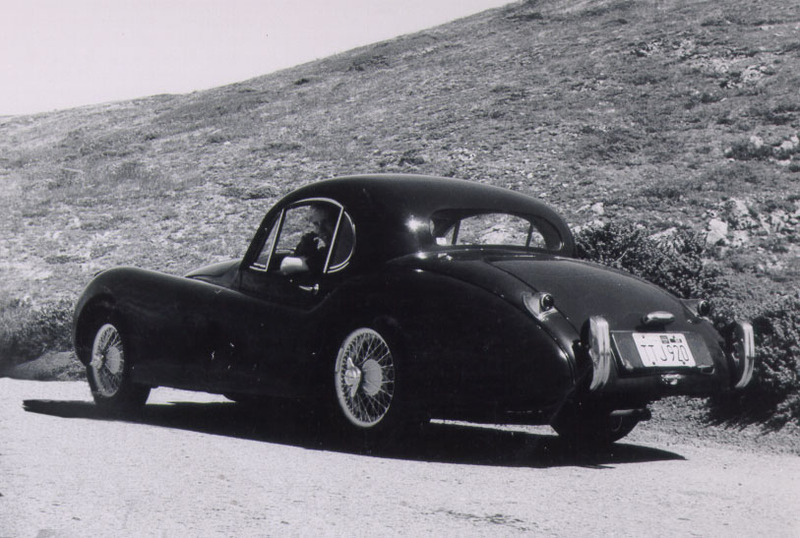 Jaguar shocked the world when it introduced the XK120 at the Earl's Court Auto Show in 1948. 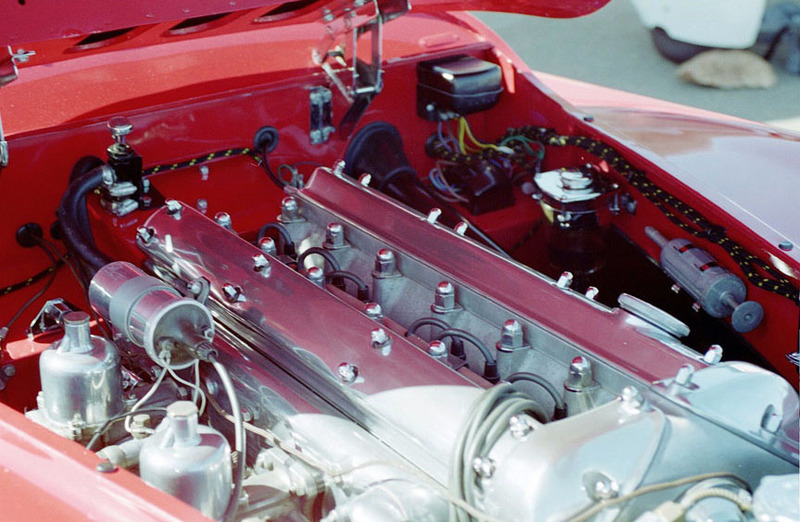 The Dual Over Head Cam inline 6 cylinder engine was a technical tour de force. 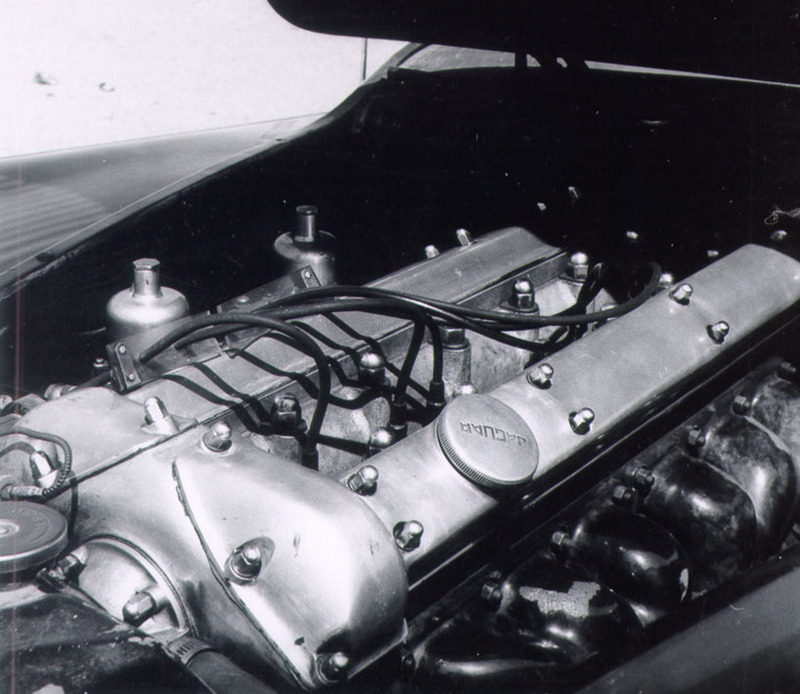 The engine was originally conceived to power a four door saloon (sedan), but that car wasn't ready, so the XK120 roadster was rushed into production as a vehicle to showcase the engine. The 120 in the name signified the car was capable of 120 mph. The fixed head coupe came along in about 1952, followed in 1953 by the drop head coupe. Sometime during the summer of 1960, my first year of ownership, my friend Chris "Kit" Latham and I drove up on Twin Peaks in San Francisco and took these shots. Notice the photo on the left. The car is cornering at a pretty good clip, you can see the right front tire bending under the rim, and the body roll is quite noticeable. Judging by the open vent on the right fender, it must have been warm that day in San Francisco. Sadly, that first carefree summer of ownership was marred by the first of many problems I would encounter. On the second day my dad and I went to see some cousins on the Peninsula. On the way home as I got on 101 and accelerated through the gears, the clutch driven disc came completely apart. We got it towed home by borrowing Dave's tow bar and I performed my first repair job. On this car, the transmission can be removed by removing the seats, floor boards, and the transmission tunnel. That made it relatively easy, working from the inside of the car. The previous owner helped me out by paying for the clutch disc. Another failure occurred when I was heading home from Beale Air Force Base to San Francisco. Traffic slowed near Vacaville. I geared down in good sports car fashion and suddenly had a bad miss. I made it to home, and removed the cam covers. I discovered a lot of broken valve springs and one broken cam follower, caused by the downshift I had made. In its weakened state, a valve floated and broke the follower. I bussed it to the base for awhile while my car's head was reconditioned at the local BMC dealer. I broke both axle shafts, one part Dave never breaks on Jags. Ha! They broke at different times, under normal acceleration, I wasn't "beating" on the car any time I broke something. I remember Dave neatly lassoing the broken stub of one axle with a piece of safety wire in order to remove it from the axle housing without having to dismantle the entire assembly. Dave was not only my hero, he was my savior. 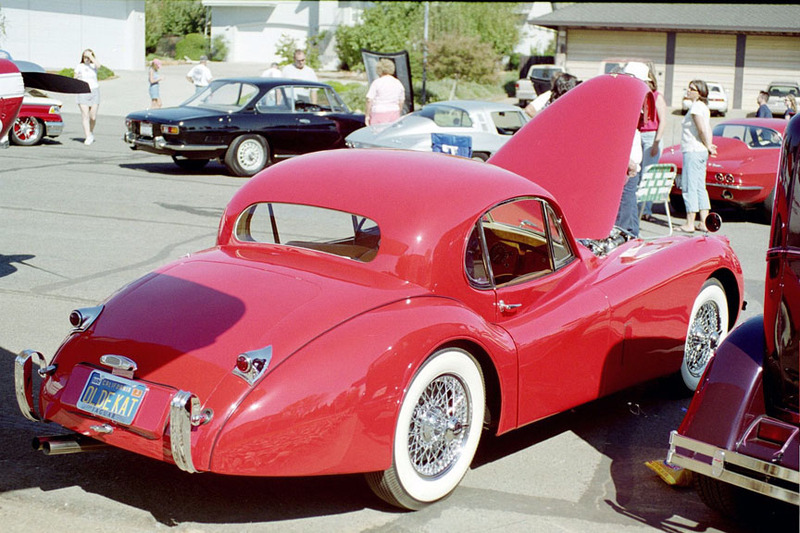 Jaguars were notorious for overheating, and I had my share since I was stationed in the Central Valley of Calif. Trying to cure the overheating problems, I rebuilt the 19th Century style water pump twice before replacing the entire pump with a much more modern design pump from an XK140 - that fixed that problem. Winters in San Francisco presented no cold starting issues, but it was cold enough at the base to be very reluctant to start on cold mornings. I wired up the disconnected electric starting carburetor with a toggle switch I scored from the Air Force. Cold morning starts were no problem, and I had that characteristic Jaguar hiss until the engine was warm enough to run without the starting carb. Like I said, I learned a lot about working on cars, and working on Jaguars in particular with this car. I almost wish I had it back, in pristine condition, of course. I would be remiss if I neglected to mention Dave's private road race course in the City. KRON which used to be channel 4 was alone in using a transmitting tower in the San Bruno mountains just south of San Francisco. A road led to the top where the station engineers staffed the equipment - nobody else ever seemed to use the road. By driving out Mission Blvd. to Crocker St., and turning left or East onto Crocker, you would eventually end up on the road to the top. It was nicely paved, and had varying elevation and curves, some smooth and fast, others quite tight and closely spaced together. At the bottom once out of civilization, was a large white square painted on a huge eucalyptus tree, and at the top, just before entering the parking lot was a white circle painted on a rock on the bluff beside the road. The drill was to drive up to the top at a moderate speed to see if anybody was driving around. Usually the only cars (one or two) seen were parked at the transmitter. 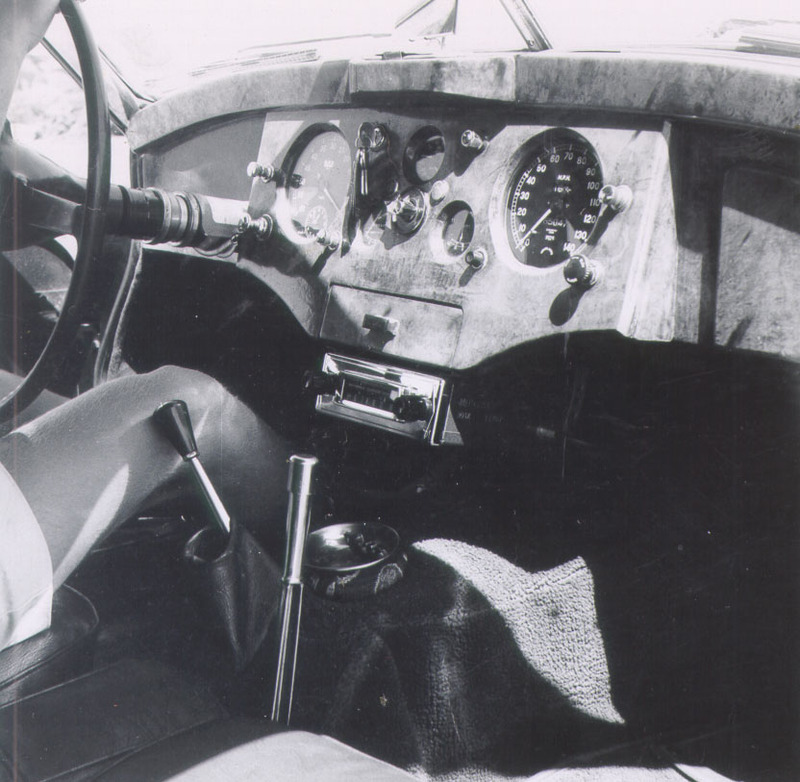 Then you would return to the bottom, and with your passenger using a stop watch, make a running start, with the time starting as you passed the marked tree. Driving as fast as one dared, make a mad rush to the top. I don't remember any of the times now, and my times were certainly a lot slower than Dave's. Dave even rode along with me one time and critiqued my driving when we reached the top. I remember most vividly the part where I was fastest was the sweeping curves where I could feel the back end of the Jag hanging out in a nice controlled power slide. For another speed contest story, go here. 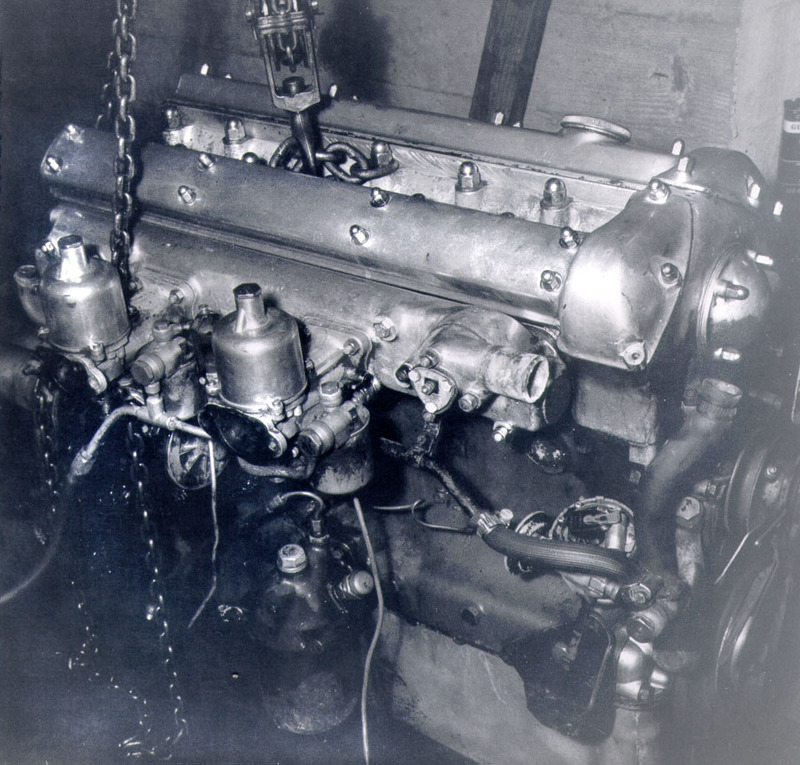 The next summer, 1961, I decided to overhaul the engine because it was very tired and burned a prodigious amount of oil. My mentor and hero Dave scored some 3.8 litre pistons that had come out of a D Type Jaguar that finished 2nd or 3rd, or something at Sebring. I removed the engine in my parents garage and with Dave's help, tools, and guidance overhauled the bottom end. For example, the chain fall in the picture is Dave's, as were the A frames to support Dave's 4X10 beam. Then were was the torque wrench, and all the other tools I didn't have. He took the time to measure the crank with his micrometer so I knew it was in fine shape and that standard copper-lead bearings would be the ones I needed. I had a service manual for reference, but Dave was the brains behind my getting the engine back together and running like a Swiss watch! One day without warning the Air Force changed their policy and would no longer let the car on base without front bumpers. I had to scramble and hitch rides to work until I found a place that made the nerf bars. It was like a blacksmith shop, but the guy was pretty handy the way he fitted them to the car. Getting them, them chrome plated was pretty simple. The Air Force was happy and let the car back on the base and so was I. The photos directly above were taken after I had installed nerf bars to replace the missing front bumpers and had the car repainted the same 'British Racing Green' as before. Midge our Bassett Hound is on guard! That grill with the fne vertical teeth was replaced with a stamped part on the next model. This grill was labor intensive to build and difficult to keep the bars straight. In 1963 all the shortcomings of this ten year old car got the best of me and I traded it in on a fancy new American car with bucket seats, a center console and four on the floor, a Ford Galaxie 500 XL. It was nice but boring and two years later I got rid of that in favor of my Mustang which was much closer to a sports car then the Ford. I see a remarkable similarity between this car and my 2001 Corvette Z06. They are separated by 50 years of technology, but in spirit they are very similar. The red car below is what my car would have looked like in its prime, a very handsome car indeed. Read the Road & Track road test and you'll see that the testers of the day thought so too.